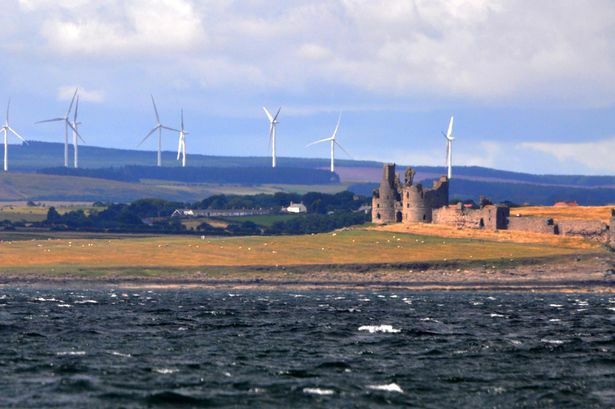 Photographs taken from off the coast of Northumberland have opened a new strand in the debate on the place of wind farms in the rural county. The pictures were taken by Bill Short and two fellow members of the Northumberland and Newcastle Society, a body which works to protect valuable buildings and landscapes and to enhance the quality of life in both urban and rural areas. With the aim of showing how clusters of turbines up to 125m high are now dominating views of the county, Mr Short and his friends took to a 29ft yacht on Sunday and sailed from Blyth harbour up the coastline to Dunstanburgh and back again. Mr Short had seen the giant structures going up around Northumberland at close quarters but had heard from his colleagues that the effect was even more startling from the North Sea. He wanted to see how the turbines appeared within the coastal landscape, in particular in relation to the county’s renowned castles, and how they would change that first glimpse of the region caught by newcomers arriving by water or plane. Mr Short, who lives at Kirkwhelpington, said: “It is quite an important route, the number of boats that go up and down the coast is quite high. It is something that must be at least as important as footpaths. “We really were quite shocked at how dramatic those photos were.” Based on these images, even the staunchest advocate of wind would struggle to argue that the turbines are not now the dominant feature in these coastal views. There are those who believe turbines are graceful elegant structures, and who may view their visual dominance of Northumberland’s coastline as welcome. But their number does not include Mr Short’s group, which believes the turbines are dominating the coastal landscape to the detriment of the castles and the North East’s heritage. The society blames the current planning process and is calling for a cessation to the approvals of wind farms, arguing that Northumberland has had more than its fair share. The society’s alarm is shared by others in the region, amid fears that new visitors’ first image of the North East, previously dominated by those castles, has been destroyed with potentially devastating consequences. Jeff Sutheran, owner of a bed and breakfast at Seahouses and the chairman of the North Northumberland Tourism Association, said: “There can be no doubt that these structures have changed the visual character of our landscape very significantly, and conversations in our own village suggest that many local residents did not appreciate how significant that impact would be during the planning stages. “The turbines are clearly visible on the horizon from Seahouses, and a boat trip to the Farne Islands reveals similar views to the ones in the photographs. I’ve heard no one say the changes are welcome. “To see such ancient and beautiful structures like Dunstanburgh and Bamburgh Castles dwarfed by the backdrop of industrial structures can only be perceived as despoiling the natural beauty of this historic landscape. Mr Sutheran’s association is backing Northumberland County Council’s plans to carry out research on the impact of the turbines on the industry, by speaking to accommodation providers and visitors. He continued: “Our own informal research, gathered during conversations with guests, reveals an interesting pattern. “Some guests are strongly against the presence of turbines, feeling that the natural beauty, open landscapes and sense of ‘remoteness’ which Northumberland offers them, is being spoiled. Others say they ‘don’t mind them’. “But no one says the landscape has been improved, and it seems that whilst the turbines are never going to attract more visitors to Northumberland, they are going to deter some. And so, over the long term, the only impact we can predict is a negative one. The Campaign to Protect Rural England has also voiced concerns, having viewed the photos. In an email, its county vice-chairman Howard Elcock says it is “pertinent” to ask who allowed such a turbine dominance and suggests the county’s MPs, in particular those inside the coalition, be pressured to “demand answers” of planning ministers. Northumberland Tourism says it has yet to form a view either way on the impacts of wind energy due to lack of information, but has welcomed the county council’s planned survey and the society’s work. A spokeswoman said it had spoken to people who felt the county “should be at the forefront of green energy”.